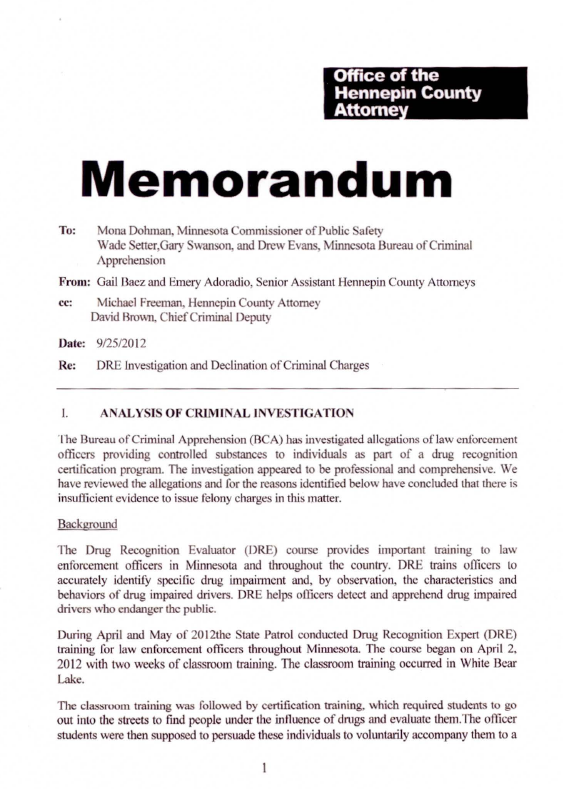 The following document contains files related to the Minnesota Bureau of Criminal Apprehension’s investigation into allegations that law enforcement officers participating in Drug Recognition Evaluator (DRE) courses provided drugs to sober people they had picked up from Peavey Plaza in downtown Minneapolis where protesters connected with Occupy Minnesota had been located since April 2012. The officers then used the intoxicated subjects for their training course, sometimes providing them with rewards like food or cigarettes, and then returned them to the Plaza. Though the investigation confirms many aspects of the story and a Sheriff’s Deputy admitted to the DRE course instructor that he had witnessed his partner in the course providing marijuana to subjects, the Minnesota Bureau of Criminal Apprehension found that there was insufficient evidence to sustain charges and obtain convictions against any of the officers involved. This was partly due to the fact that 29 former officers and employees associated with the program refused to testify, blocking the investigation. For more information on the file, see Dan Feidt’s article on the documents and watch the video report he helped produced in May 2012 which played a significant role in raising public awareness of the issue and spurring the investigation. The Bureau of Criminal Apprehension (BCA) has investigated allegations of law enforcement officers providing controlled substances to individuals as part of a drug recognition certification program. The investigation appeared to be professional and comprehensive. We have reviewed the allegations and for the reasons identified below have concluded that there is insufficient evidence to issue felony charges in this matter. The Drug Recognition Evaluator (DRE) course provides important training to law enforcement officers in Minnesota and throughout the country. DRE train officers to accurately identify specific drug impairment and, by observation, the characteristics and behaviors of drug impaired drivers. DRE helps officers detect and apprehend drug impaired drivers who endanger the public. During April and May of 2012 the State Patrol conducted Drug Recognition Expert (DRE) training for law enforcement officers throughout Minnesota. The course began on April 2, 2012 with two weeks of classroom training. The classroom training occurred in White Bear Lake. The classroom training was followed by certification training, which required students to go out into the streets to find people under the influence of drugs and evaluate them. The officer students were then supposed to persuade these individuals to voluntarily accompany them to a Richfield training facility where they would provide a urine sample. This sample would then be tested to determine whether the participant was impaired as the officer had believed, and if so, what drug had been ingested. To encourage cooperation, officers never recorded participants true names. On May2, 2012 allegations were made in the local media that DRE officers were not just seeking already “high” people to participate in testing. Allegations were that officers were providing controlled substances to sober people so that they could become “high” and then participate in testing. One individual, Forest Oliver, claimed that he had participated three times in the DRE testing and DRE officers had given him marijuana on each occasion. Some of these allegations had appeared in previous days on YouTube. In response to these allegations, instructors asked their class whether they had engaged in such conduct or had heard of any classmates doing so. They emphasized that DRE students should not provide potential test participants with controlled substances. No DRE officer admitted in class to knowledge of such conduct. However, after class that day on May 3, 2102, Chisago Deputy Sheriff Andrew Mahowald told head instructor State Patrol Sgt. Ricardo (Rick) Munoz that he had witnessed his DRE partner, Hutchinson Officer Karl Willers, provide marijuana to test subjects. Mahowald coming forward with this information ultimately led to Hutchinson Police Chief Hatten requesting a BCA investigation of allegations regarding Hutchinson officers.